The Classic Western Rider is an eclectic work that appears to be more a collection of articles than an uniform book on the subject. In fact, four of the book's nine chapters were written by other authors — not a bad idea when the authors have particular knowledge on the topic and can present it well. The book's title seems an afterthought, however, since no explanation is given as to what constitutes the classic western rider or how this rider differs from any other western rider. In slightly more than two hundred pages, the book tries to cover a lot of territory. The author begins with a brief history of the origins of western riding and how these origins evolved over time through the experience of horsemen and women working in what is now the western United States as well as the influence of literature, movies, and television. There is a chapter on tack as well as one on training. There is even a chapter on dressing the part that explains how a rider's appearance is expected to vary from one competitive event to another. The majority of the chapters introduce the rider to a variety of western riding competitions including: equitation, western horsemanship, reining, team penning, and other speed and skill contests. if you want to rise to the top, you must shoulder the responsibility of educating yourself. The avid horseman should not take this as merely advice to read this book but to read widely and seek out instructors who can evaluate and correct his or her riding habits. . This attitude leads to an effort to understand the partner and afford him the courtesy of clear communication. 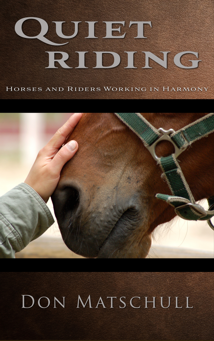 a harsher bit isn't the answer to solving a problem you are having with a horse. A major principal stressed throughout the book is that the rider should learn how to ride properly and not depend on gimmicks or equipment to achieve the desired result. you will, without hurrying him, keep his mind engage on your conversation and the task at hand. The idea is that spending time getting the basics correct saves time in the overall training process. leg slightly ahead of or at the cinch. While this method works, it runs counter to the generally accepted advice of drawing the outside leg back to encourage the horse to bend throughout his body. Again, she advises throwing the horse off balance to achieve a flying lead change. While this method works, it lacks the elegance of achieving the change with the horse in balance. As with all books, the advice provided should not be taken in isolation. 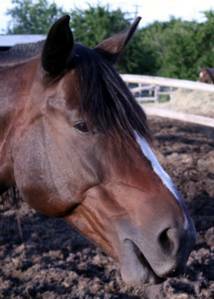 Compare the advice provided with that given by others, experiment, and listen to your horse.